This entry was posted in Warcraft and tagged bragging, Gear, loot, screenshot, system, world of warcraft, wow by Typhoonandrew. Bookmark the permalink. God Sal, I’m hoping that the “get 12x” takes less time than the “get 20x”. Hoping. Praying. 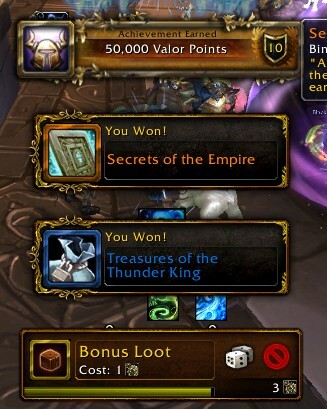 The old system was best, even taking offspecs needing on items, ninjas and guildies passing loot into consideration I had more loot in Dragonsoul and was able to gear an alt there. The old system was only better if you were working together with others. Back then it was 4 items for 25 people, which on average gives you a 16% chance of winning something. The new system has a flat 16% chance.If you take into consideration other players working together or just rolling to DE items, then you chances in the old system fall below 16%.So saying the old system was more profitable is statistically false. You were just lucky back then or worked with others.